We’re obviously partial, but custom framing is a truly unique business and offers so many areas of customization. We’re part light manufacturing, part designers, part craftsman and love any opportunity to combine these attributes to step up your custom framing. We often refer to our Wizard 9000 mat cutter as our part time employee. We love having a computerized mat cutter here at Anthology because of the many options it give us to enhance custom framing. One of our favorite features is the pen option. It’s function is to offer an alternative to hand drawing French Lines and replaces traditional brass or silver plaques. On many designs, we incorporate lines with text. Another benefit is that we have many fonts and pen colors available to make your piece unlike anything we’ve done before. 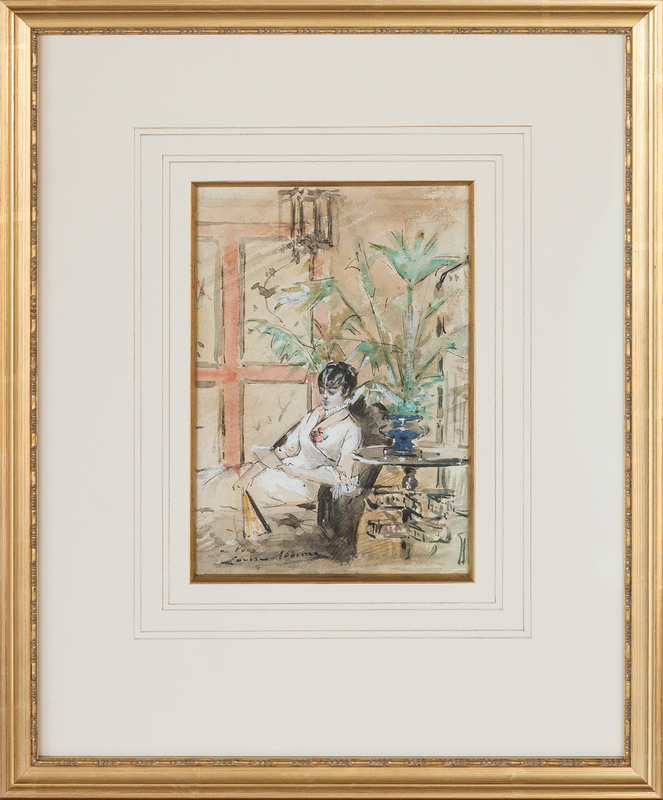 We hope you will draw inspiration from the following designs to use in your own custom framing! 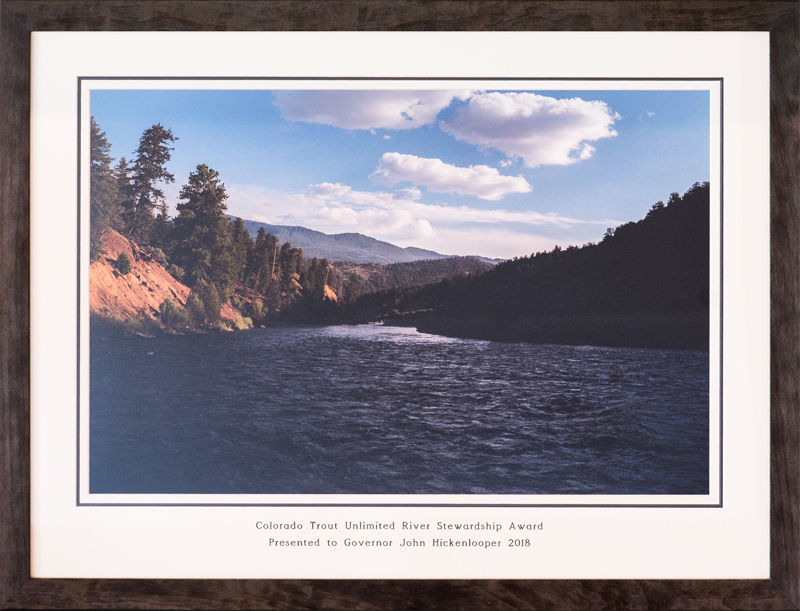 This first sample is photograph by Josh Dupelchian and was a gift to Governor Hickenlooper from Colorado Trout Unlimited. 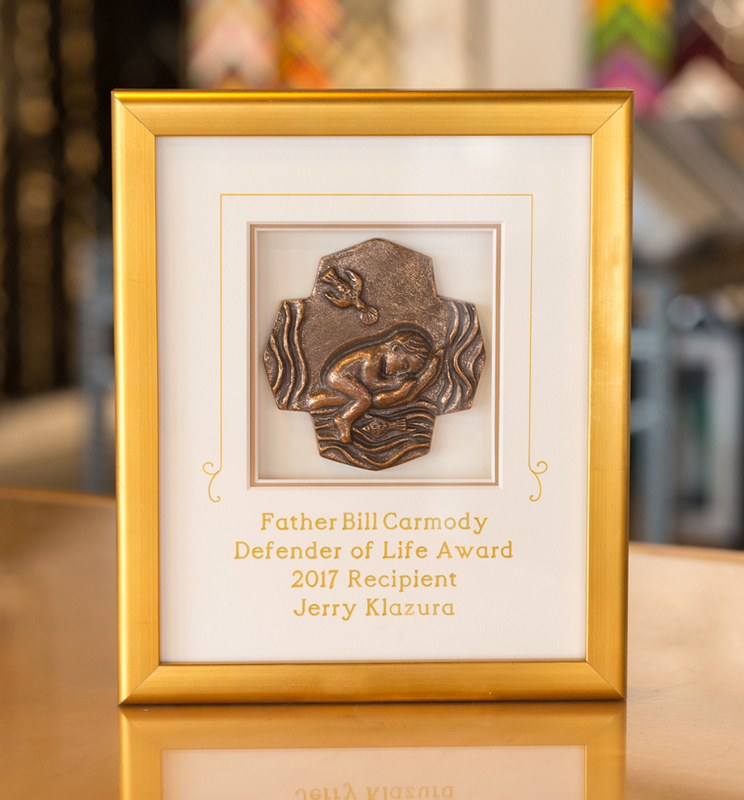 Traditionally, a plaque might have been engraved and placed on the mat or directly on the frame. A plaque was impractical for this custom frame due to the size of the photo and the substantial text they wanted included. Also, any metal incorporated into the design would have been distracting from the organic nature of the photograph and the wood texture of the frame. Long time clients, Talia and Daniel Haykin, came to us recently with a unique request. 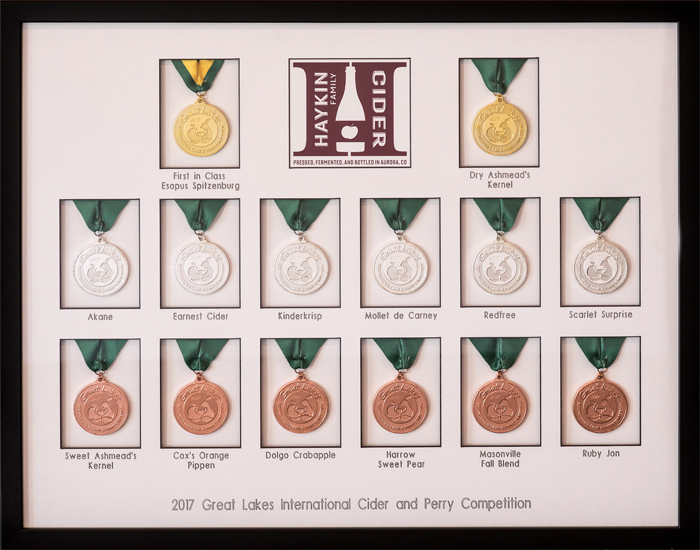 They opened Haykin Family Cider last year, turning a passion into a family business. Something we can relate to! 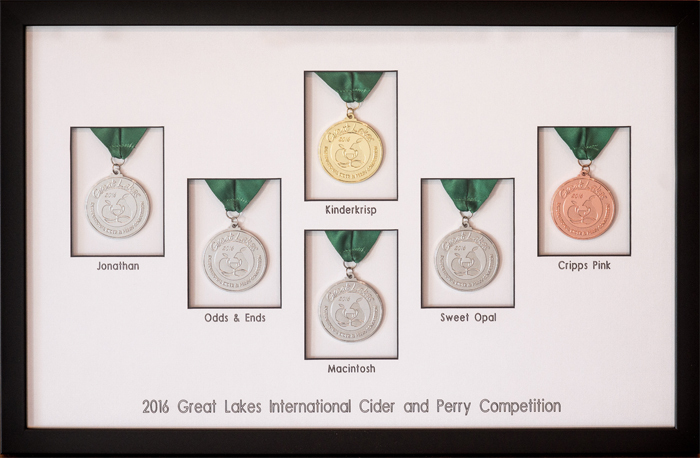 Before they had their own cidery, Daniel was already winning awards. They brought us medals they’ve won and asked us to incorporate the competition name as well as the varieties into the custom framed shadow boxes. We laid out the designs to highlight each medal in it’s own window and had the CMC write the details. We chose basic black & white for the designs to match their modern tasting room in Aurora. This will also allow us to seamlessly add to their award wall as they win more each year. You can find their retailers on their website or visit the tasting room Thursday-Saturday evenings. 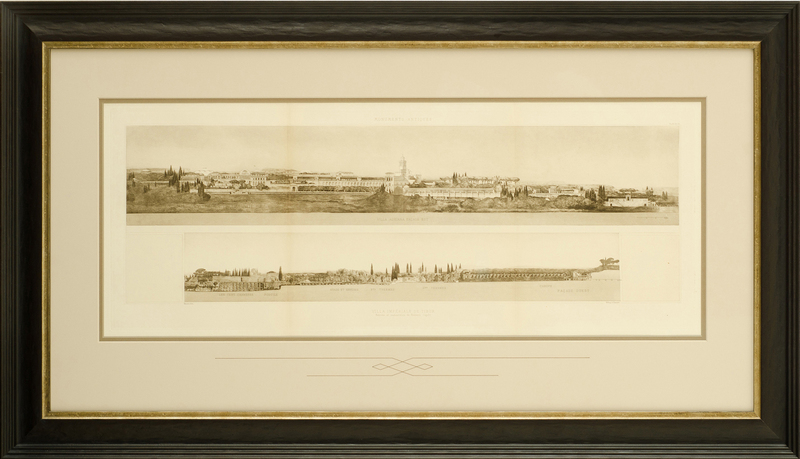 This next custom framed sample is an antique print collected by a client. There was considerably more paper at the bottom of the print than the top and sides. We weighted the bottom of the acid free cotton rag mat and added a small pen design element to balance the negative space. This next design showcases a traditional French line in addition to text. We custom frame these metal plaques as awards with the year and recipients name. The gold pen offers a great repetition with the gold frame. 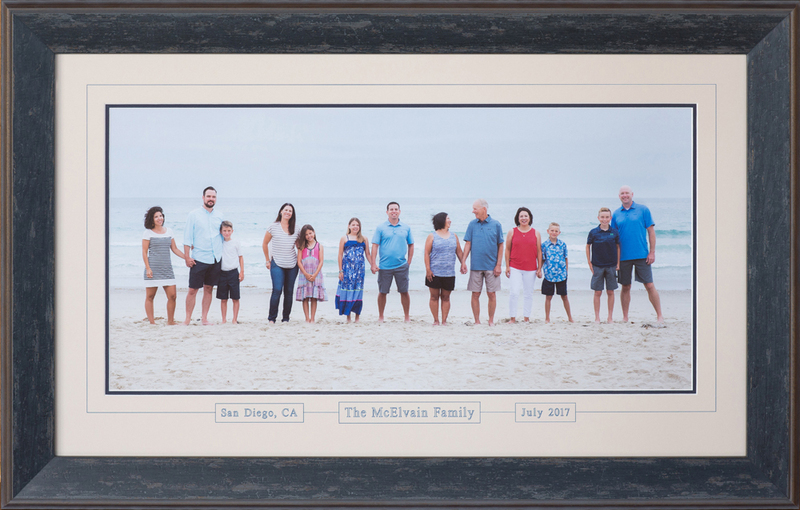 When you own a custom framing business, you tend to experiment with your own family. Last summer, we had the pleasure of visiting San Diego with the entire clan and made the commitment to do a family portrait. For me, gifts for my parents are about the most challenging to buy. I had one of the photos enlarged and wanted to custom frame it for their home. Over the years, we’ve framed and reframed many family portraits for our clients and often if the photo is more than a decade old, people forget the where and when it was taken. I decided to add the detail of the line, the text and the text boxes to keep a modern feel and add to the overall size of the piece. In case you’re wondering, my mom loves seeing this everyday! This is about the most classic design of French Line Matting. We used a gold fillet inside the mat opening and a double French Line, a water guilded gold frame compliments the style and design of the antique watercolor. This traditional use of a pen line honors a centuries old technique that is still appropriate for current trends.